Are you looking for a small copier for your office that is robust and that can do awesome color? The Xerox Versalink C405 may be exactly what you are looking for. 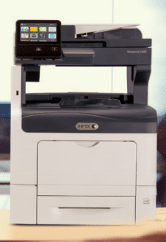 With copier speeds at about 35 pages per minute and the capacity for quality letter/legal prints, the Xerox Versalink C405 can replace that huge copier so many companies have these days. We are excited to offer it, because this copier is under $1000 and if you lease it, it is roughly $20 to $25 per month plus the service plan. Some folks want to avoid getting a service plan because they feel they can get the supplies and service cheaper themselves, there are a few reasons why this does not tend to be true. When you buy the supplies and services yourself, if the toner dies at 70% of the normal life rather than 100%, that is a cost you have to burden. If your print coverage is high, then the expected yields happen to be not accurate at all. If it say 10,000 prints are expected at 5% coverage, but you do 8% coverage, then you will get more like 7000 prints, and then you have to factor in the costs. Wouldn’t it be nice to have a copier that doesn’t break the bank and does nice color? If you want to get started, give us a call, we would love to help you. We are Xerox authorized and have been selling copiers for 10 years and we would love to help your company!